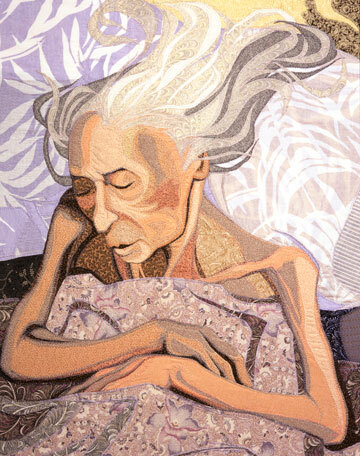 The Last Thread on April 21, 2009 Listen to a 5-minute interview: Deidre Scherer creates portraits that capture the final days of a person’s life. Her unique technique and compassionate manner are explored in this report by independent producer Meghan Vigeant. Click the image to hear the interview. BCTV Living and Dying -interview on September 3, 2013: Scherer discusses how she became inspired to seek elders as subjects in her art, and how she brings light to our fear of dying and death. In Working With Fabric, she shares her approach to drawing freely with scissors and sewing machine in the medium of thread-on-layered-fabric. Here is the video from our artists talk at Mitchell-Giddings Fine Arts on October 27, 2018. Jackie Abrams and I cover the inspirations and processes behind our three-dimensional collaborations.